After the catch up report yesterday this one covers the three visiting Asha Kiran Ashram (AKA) over the mountains and into the eastern state Tamil Nadu. Tom joined the team so they could enjoy a few days with the children together. On Wednesday Philip also came for a short visit with staff from the Special Therapy Centre to see what they could learn or share with AKA. This part of any HHI trip to India is always a highlight and this year was no exception. Although all work and no play makes Edmund a happy man the other three did use their powers of persuasion (grumbling mainly) to include some down time, more of that later. Before getting into the news, some words about transport in India. HHI works in many different places, some nearby and many some distance away. Over the two weeks the team will be using many forms of transport – car, tuk tuk and bus. The trip to AKA included all three. A few days ago the team went into the local town to meet someone and Chris noticed they were using the Centre’s vehicle. Only the night before Philip had mentioned the brakes were not working. “Are they fixed?” “No,” said Philip, “not yet, but the back ones are OK!” Travelling by tuk tuk is, shall we say, interesting but very cheap. They also seem to hold more people than you might imagine, a bit like the Tardis. One arrived at AKA with 10 adults, two children and of course the driver. A long bus journey also has its exciting moments or frightening moments depending on whether your eyes are open or not. Just imagine setting two or three lorries, a bus or two, several motorbikes and lots of tuk tuks going along on a road in two directions, mostly. All drivers with blindfolds on and using only the horn to identify themselves – that is what it is like on Indian roads. Never mind, a three and half hour trip on a bus only cost a pound each. All together the journey included a car, three buses and two tuk tuks and took about 5 hours – partly due to a visit to Cortullam Falls, a Hindu pilgramage site, where they stand under the waterfall and bathe. The team also saw a troupe of monkies scurrying around on the hillside. Three or four came down and got a little closer and whilst sitting having a cup of tea one monkey stormed the café counter and stole a bun! Arriving frazzled, tired but safe, the team were greeted by Pastor Santhosh and his wife Sheela. Sheela’s cooking is superb, fizzy drinks flowed freely, even at breakfast times and the team slept in a hotel just down the road – two rooms for two nights came to seventy pounds – quite expensive for India. However the stay was very comfortable and rewarding. The first thing the team noticed was all the chickens. Santhosh had started this new programme some months ago and now has 700 chickens with a target to have 2000. This will raise money for his work there. The chicken population will increase using a 200 egg capacity incubator. An egg will hatch in about 21 days. One of AKA students, Amir Kahn, was so taken by this project he now has 10 of his own at home and Santhosh may employ him soon to look after the hen farm as it gets bigger. There was enough time for the team to go into the school and watch the children at their classes. As you might expect, their arrival caused quite a stir. Some familiar faces, who recognised Edmund, Chris and Tom and some new students. Carol was the focal point at AKA and later on too in the nearby village. Stroking her arm, the children said she was ‘lucky’. Wednesday was set up to be a special day – the children were going to wear their new uniform and later in the day they would have sports and entertainment for their guests. During the visit Pastor Santhosh told Edmund about his plans including a new Physiotherapy Hall. Almost half of the funds are set aside or pledged and includes 50,000 rupees (500 pounds) donated by the Doctor whowas at AKA to give the children one of the regular check ups. HHI lent appeal will include this as one of the projects receiving money raised. Also there are plans to provide separate living accommodation for the boys who stay overnight whilst the girls use the existing accommodation block. This is needed to meet Government regulations. As well as expanding his chicken empire, Pastor Santhosh wants to re-introduce tailoring classes which may cost as little as 50 pounds per month, if any one reading this wants to contribute please contact HHI. 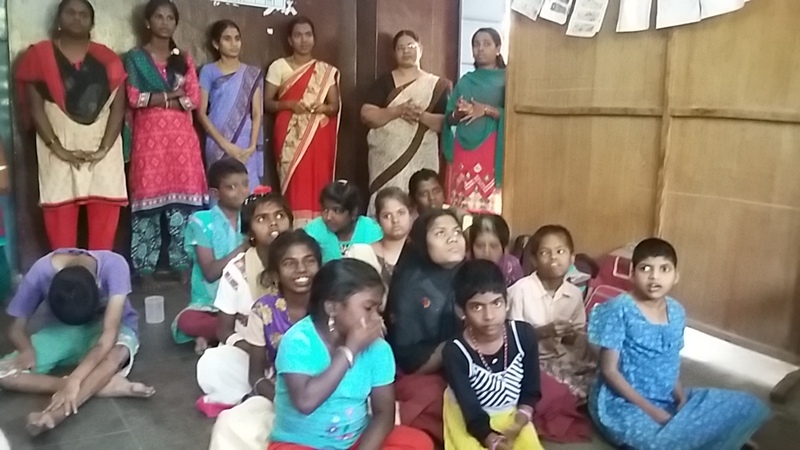 As well as the school for physically and mentally handicapped children there are also Adult Literacy classes held in Pator Santhosh’s second church just down the road. This progamme is funded by an Indian organisation. But what about the children and their progress? Tanga Wilson is 18 years old with cerebral palsy and mental disability. He has been at AKA for 3 years and at the start of his time he could not write. He recently composed and wrote a job application letter. He has also sufficient numeracy skils to work out change when he spends money on items. Sivasankari is a 17 year old girl with a heart murmer and thyroid problems. She has been at AKA over 3 years. In her time she has learnt to count, write simple things like her name and address, read small words and do simple subtraction. In the evening the team went to the church mentioned earlier and wer joined by about 30 children for a short improvised time of worship, including song, stories and dance. The children all received lollipops, knitted toys and biscuits. Whilst the team were at AKA they met Srikant who is helping out. His wife has an unknown blood disorder and HHI will contribute to the cost of blood tests. Ther is also a new Physiotherapist who has only just started so it was too early for her to provide news of progress. However Edmund and Chris have agreed between them to pay for a walking frame for Shabu Begam and calipers for Loginathan, Vertrial, Rajesh, Essaki, Uma and Kannimimal. Shabu cannot walk without support and will also need an operation. A young girl, Esikema, has a benign cyst on her head and the Doctor advised that it should be removed. She should get this operation free, however HHI will contribute with costs as the family cannot afford to pay anything. One final piece of news – Saravana has just started attending AKA, he is autistic with mental problems. His sister, who was there during the team’s visit, said she had already noticed an improvement. Well done Asha Kiran Ashram, keep it up you are doing a fabulous job as the team witnessed- bringing images of smiling happy children back with them to their ‘home’. However they weren’t smiling on the bus home – though they had reserved their 1 pound seats the bus was full to the gunnels. Imagine a lift for 8 people and put 30 people in it and you will get the picture! Good night.